a) optimal network utilization and b) compliance with application Quality-of-Service (QoS) requirements related to the time horizon, from the occurrence of interesting situations, in which corresponding reports should be made available to end users. Our algorithms and design principles are generic enough to support a wide range of application query functionality. They can be employed on top of any CEP Engine being selected as the software responsible for intra-cloud data processing and query execution at the site level. Therefore, our approach can be fostered as a paradigm for any similar implementation irrespectively of the CEP Engine or specific application demands. Having clarified that, in the context of FERARI, the currently developed software is built to support – in terms of application query operators and respective functionality – IBM Proactive Technology Online (Proton) CEP Engine and in particular its streaming cloud extension, namely ProtonOnStorm. This is not too great a restriction as Proton and ProtonOnStorm are open source platforms with an already important user base, as will be explained below. Moreover, the TEM specification which is another important FERARI asset for letting business users express inquiries in a declarative way (details see above), can be mapped to an Event Processing Network (EPN) conceptualization which is supported by ProtonOnStorm at the technical level. Therefore, the TEM specification is commutatively supported by our approach. 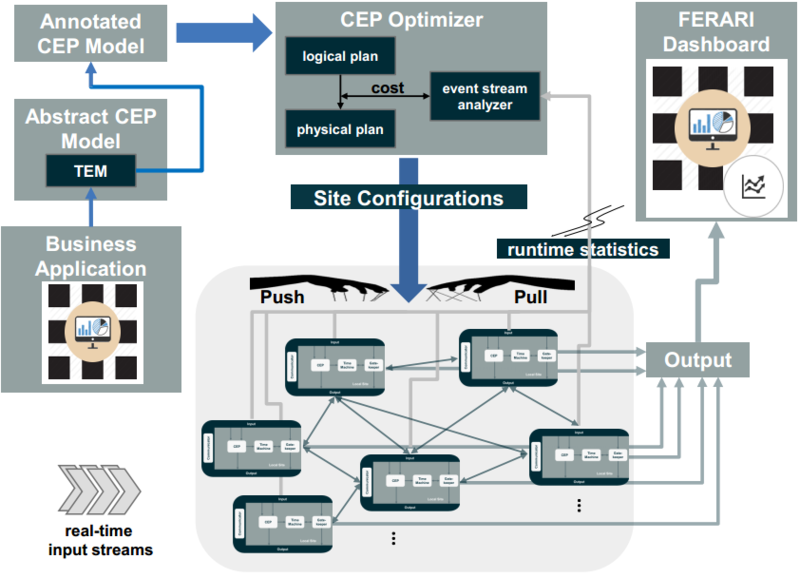 In addition, the CEP optimizer outcomes incorporate and exploit the FERARI assets related to in situ processing at the site level. in: SIGMOD, 2016 (accepted – to appear). in: DEBS, 2016 (invited submission – under review).